2. Should we regulate cryptocurrencies? 3. Is there a legal definition of cryptocurrencies or “virtual currencies”? 4. How do we regulate? 6. What does the Tax Agency (Agencia Tributaria Española or AEAT) say? 7. What does the Senate of the Spanish Parliament (Cortes Generales) say? 8. 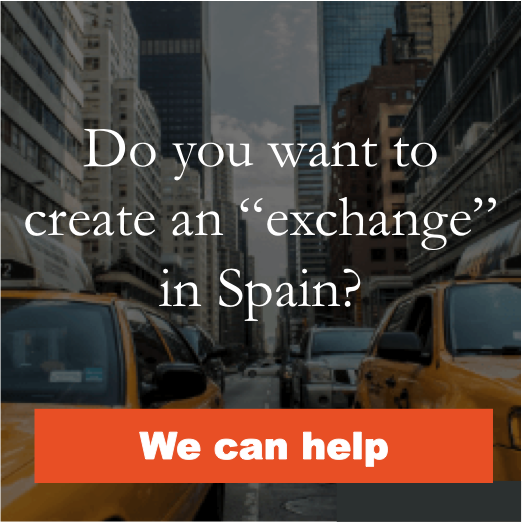 What do the Bank of Spain (Banco de España) and the National Securities Market Commission (Comisión Nacional del Mercado de Valores or CNMV) say? 9 .What lessons have we learned? You’ve probably heard at some point of Bitcoin, ether, dash or litecoin. These are names that identify some of the best-known “cryptocurrencies” (also called virtual currencies, crypto currencies or virtual currencies) that currently exist. Cryptocurrencies were born with the purpose of allowing the realization of economic transactions or exchanges of goods (physical or virtual) and services without the need for intermediaries. Therefore, what most of them have in common – and the difference of traditional money – is that they are created electronically, are based on the P2P network, are supported by Blockchain technology and are issued outside of central banks without responding to the control of any country or institution. They began to be used in 2009 with the appearance of Bitcoin, as an alternative method to the traditional financial system, and their existence has been gradually spreading among the population (here the text of Satoshi Nakamoto where the creation of Bitcoin is announced and explains its operation). Various voices have labeled cryptocurrencies as opaque, highly volatile and high-risk assets, and they have been considered instruments for the commission of crimes such as money laundering, tax evasion and fraud. In this panorama arise two questions: Should we regulate cryptocurrencies? How do we regulate them? Most cryptocurrencies rely on the Blockchain and are issued outside of central banks. The legal regulation of virtual currencies is in its early stages today (very few countries have regulated them, although the number of them is increasing, as can be seen from the Report of the Law Library of the Congress of the United States of America). In Spain, the Cortes Generales – the body that exercises the legislative power of the State through its two Chambers, the Congress of Deputies and the Senate – have not passed any law on cryptocurrencies. In other words, there is currently no legal regulation on virtual currencies in our country. When you think about an appropriate legal regulation for cryptocurrencies, many questions come to mind: Should we consider cryptocurrencies as currencies, financial products, or merchandise? If they were considered as merchandise, the purchase of cryptocurrencies would give the consumer a right to withdrawal; how could that right be exercised? What type of information to disclose among the public should be required from the companies that issue them? How should they be taxed? Should we design a unique legal treatment for all the cryptocurrencies or create a special regulation for each type of virtual currency? 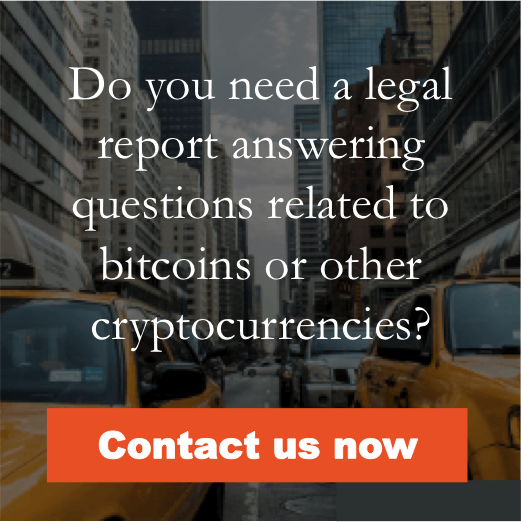 The Court of Justice of the European Union (CJEU) has already adopted a position on Bitcoins, although it does not answer all the questions previously raised. 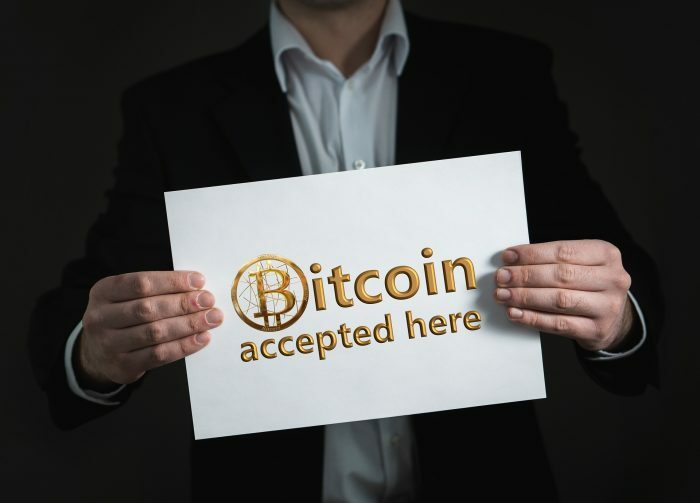 The CJEU in its judgment of October 22, 2015, (case C-264/14) has highlighted the nature of means of exchange and means of payment: “that the ‘Bitcoin’ virtual currency with bidirectional flow, which will be exchanged for traditional currencies in the context of exchange transactions, cannot be characterized as ‘tangible property’ within the meaning of article 14 of the VAT Directive, given that, as the Advocate General has observed in point 17 of her Opinion, that virtual currency has no purpose other than to be a means of payment” (paragraph 24 of the judgement), indicating that their transactions can also constitute “financial operations” if they have been accepted by the parties as an alternative to the legal means of payment (paragraph 49 of the judgment). Based on the foregoing, the CJEU concluded that the exchange of traditional currencies by units of the “Bitcoin” virtual currency, and vice versa, is considered a “transaction exempt from VAT”. In short, what the CJEU said is that – for tax purposes – virtual currencies can be exchanged in the same way as conventional currencies (examples: euro, dollar, etc.) so they will also be free from value added tax or VAT (example: when you deliver euros and you receive Bitcoins in exchange, you will not have to pay VAT). The central axis of the CJEU position is the consideration of “means of payment” of the Bitcoins. In this regard, according to Professor Luis Javier Cortes, the fact that something serves as a means of payment means that “that something is accepted in exchange for goods and services” which is what happens with legal or traditional money (either currency or banknotes) and “that it has a liberating power”. The CJEU considers Bitcoin as a virtual currency of bidirectional flow and a means of payment. Yes. The Directive (EU) 2018/843 of the European Parliament and of the Council of 30 May 2018 amending Directive (EU) 2015/849 on the prevention of the use of the financial system for the purposes of money laundering or terrorist financing, and amending Directives 2009/138/EC and 2013/36/EU entered in effect on July 9, 2018. This Directive, also known as the Fifth Directive, modifies the so-called Fourth Directive (that is, Directive (EU) 2015/849) and, in this way, introduces the definition of what “virtual currencies” are (see article 1 that adds point 18) to article 3 of the Fourth Directive). They are a digital representation of value. They are not issued or guaranteed by a central bank or by a public authority. Therefore, they are not official money. They are not necessarily associated with a legally established currency. They are accepted by natural or legal persons as a means of exchange. They can be transferred, stored and negotiated by electronic means. In addition, the Fifth Directive recognizes that virtual currencies – and hence Bitcoins – are frequently used as means of payment, but also for other purposes, such as means of exchange, investment, value reserve products, and use in online casinos (whereas clause 10). Meanwhile, the Court of Justice of the European Union (CJEU) in its judgment of October 22, 2015, (case C-264/14) has highlighted the nature of means of exchange and means of payment (“that the ‘Bitcoin’ virtual currency with bidirectional flow, which will be exchanged for traditional currencies in the context of exchange transactions, cannot be characterized as ‘tangible property’ within the meaning of article 14 of the VAT Directive, given that, as the Advocate General has observed in point 17 of her Opinion, that virtual currency has no purpose other than to be a means of payment.”), indicating that their transactions can also constitute “financial operations” if they have been accepted by the parties as an alternative to the legal means of payment. It is relevant to mention that the Fifth Directive differentiates virtual currencies or cryptocurrencies from other types of financial creations in a way that should not be confused with electronic money as defined in point (2) of article 2 of Directive 2009/110/EC of the European Parliament and of the Council, with the larger concept of ‘funds’ as defined in point (25) of article 4 of Directive (EU) 2015/2366 of the European Parliament and of the Council, nor with monetary value stored on instruments exempted as specified in points (k) and (l) of article 3 of Directive (EU) 2015/2366, nor with in-game currencies, that can be used exclusively within a specific game environment. What is the objective of any legal regulation of the financial markets? When we talk about money, we have to necessarily talk about financial markets, which is where financial transactions take place, that is, operations or businesses where money is the object of contracting itself. In Spain, financial markets constitute a regulated sector since private autonomy and freedom of enterprise are subject to administrative supervision. Therefore, the financial activity is exercised in a framework organized by peremptory norms whose violation determines the existence of infractions and administrative sanctions. Dissemination of information (disclosure) not only on circumstances and objective economic data, but also subjective or pertinent to the subjects that demand financing, in order that the markets are sufficiently transparent. To establish dispositions that define the statute and the activities of the financial entities proper, or of those others that, in some way, collaborate or are present professionally in the financial markets, considering their solvency and correct performance. To design the norms that deal with the regulation of the relationships that are concluded between the parties and, especially, the technical aspects of the establishment and operation of the organized markets (such as definition and normalization of the assets contracted, systems and guarantees of negotiation and liquidation) that are decisive to guarantee the legal security and economic efficiency of the transactions that take place in them. To create public entities (Bank of Spain-Banco de España and National Securities Market Commission-Comisión Nacional del Mercado de Valores, in the case of Spain) responsible for supervising and controlling compliance with financial market regulations and the performance of financial entities. Taking into account the aforementioned, below I will show in summary what is the current “regulatory” trend in terms of cryptocurrencies in Spain. That is, I will refer to the position adopted by certain institutions and bodies of the State, such as the Central Organ for the Prevention of Money Laundering of the General Council of Notaries Public (Consejo General del Notariado), the Tax Agency (Agencia Tributaria), the Senate (Senado), the Bank of Spain (Banco de España), and the Commission. National Securities Market (Comisión Nacional del Mercado de Valores) with respect to cryptocurrencies. Subsequently, I will refer to the regulatory trends in other States. The sites where cryptocurrencies are sold are vulnerable to hackers. Due to the fact that an increase in the use of Bitcoins and other cryptocurrencies was detected in the constitution of companies and capital increases, the Central Authority for the Prevention of Money Laundering of the General Council of Notaries Public (Órgano Centralizado de Prevención del Blanqueo de Capitales del Consejo General del Notariado or OCP) has decided to take matters into their own hands. What is the underlying problem here? The platforms of purchase and sale of “cryptocurrencies” do not normally require their users to identify themselves through an official identity document, which makes it impossible to find in the “Blockchain” – the database where all the transactions of the virtual currency are recorded – the person behind the registered “movements”. This, in the words of Pedro Galindo, director of the OCP, pronounced in January 2018, makes Bitcoin a “high risk investment” product. The solution to this problem would be, according to this body of the notary, in a modification of the European Directive against money laundering (i.e. the Fourth Directive) where the intermediary societies of “cryptocurrencies” were forced to carry out due diligence measures such as requiring identification with an official identity document of their customers to know who buys and who sells this type of asset. Providers engaged in exchange services between virtual currencies and fiat currencies, where we could include the so-called exchanges as well as Bitcoin ATMs that carry out purchase and sale operations of said cryptocurrency. Custodian wallet providers, defined as an entity that provides services to safeguard private cryptographic keys on behalf of its customers, for holding, storing and transferring virtual currencies. Before, neither of the aforementioned entities was required by the EU to detect suspicious activities. With this change it is intended that these operators now report suspicious transactions, as well as partially restrict the anonymity that cryptocurrencies allow, which could be attractive for financing terrorist activities, according to the Fifth Directive. Another new measure in relation to these subjects is the obligation to be registered, although it is not specified in what type of registration or the terms and conditions of it. It should be noted that this legislative change will only partially solve the problem of the “anonymity” of virtual currencies, given that their owners can carry out transactions outside of exchanges and ATMs, in which case such transactions would be outside the scope of the new regulations on prevention of money laundering and financing of terrorism. Do you know what the OCP of the General Council of Notaries has said about cryptocurrencies? On January 23, 2018, the Tax and Customs Control Plan of 2018 (Plan de Control Tributario y Aduanero de 2018) was published in the BOE, where general guidelines are established to reinforce control over new business models over the Internet and new payment models such as electronic purses. In order to face “this threat”, it is indicated that the AEAT will enhance the use by the research units of the new information collection and analysis technologies in all types of networks, and that it will study the “fiscal impact” of these new technologies, such as the “Blockchain” and, especially, cryptocurrencies. It is clear that despite the difficulties surrounding the cryptocurrencies regarding the identification of the owners thereof, this does not exempt them from having to comply with the corresponding fiscal obligations, different depending on the operation performed with them. Here you can read a brief guide on the taxes that must be paid, according to the type of transaction (purchase and exchange of Bitcoins, and wealth tax). Regarding the Tax on Patrimony, the AEAT has evacuated a binding consultation on the obligation to declare this tax. The AEAT has also declared its position regarding the obligation of registration in the Tax on Economic Activities (Impuesto sobre Actividades Económicas), assimilating the activities related to cryptocurrencies -such as the “mining” of Bitcoins– to those of financial services. Do you know what the Tax and Customs Control Plan of 2018 of the AEAT says about cryptocurrencies? On February 7, 2018, the Spanish Senate approved a Motion urging the Government to assess the regulation of cryptocurrencies to guarantee legal certainty and avoid fraud, presented by the Popular Parliamentary Group on 29.01.2018 (corrected on 30.01.2018 and modified with date 07.02.2018). Here is the Agreement approved by the Senate Plenary. Cryptocurrencies are risky assets and can hardly be used as means of payment: it is based on the premise that these are speculative assets that should not be offered in the retail market because they pose a risk for the small investor and for all States. Cryptocurrencies favor the commission of certain crimes: money laundering and financing of terrorism, tax evasion, and drug trafficking are mentioned. It is recommended to consider entities that are subject to money laundering regulation both to providers of virtual currency exchange services for fiat currencies and to providers of key escrow services or virtual purse providers, so they should be obliged to identify their customers. It is necessary to study the fiscal aspects of cryptocurrencies in order to avoid any type of evasion: we start from the premise that we are dealing with anonymous and opaque assets since it is difficult to know the buyer and the seller of them, besides that the identities of the cryptocurrency management, issuing and inventing companies are unknown. Global supranational regulation is necessary to improve legal security: users are warned of the risk of fraud and bubble of cryptocurrencies as well as the need to be prudent in their use. Do you know the content of the Motion on cryptocurrencies presented by the Popular Parliamentary Group to the Senate on 29.01.2018? On February 8, 2018, the Bank of Spain and the CNMV published a Joint Statement addressed to investors and users of retail financial services, where they warned of five specific risks related to the acquisition of cryptocurrencies and participation in an ICO. Cryptocurrencies are not subject to legal regulation or supervision: therefore, the acquisition and maintenance of cryptocurrencies do not benefit from the guarantees and safeguards associated with regulated financial products. Applicable law and the competent judge are commonly foreign: Given the cross-border nature of ICOs (the actors involved in the issuance, custody, marketing of cryptocurrencies, such as exchange platforms, ICO issuers, or digital portfolio providers, commonly located outside Spanish territory). Therefore, if presented in a conflict, the applicable law and the competent judge could be foreign. Investments in cryptocurrencies are not protected by a guarantee fund, as is the case with bank cash or securities deposited in credit institutions and investment service companies. The investment in cryptocurrencies is highly speculative. Its close dependence on poorly consolidated technologies increases the risks of operational failures and cyber threats which can lead to temporary system unavailability or even total loss of the amounts invested. The sale of “cryptocurrencies” in order to obtain conventional cash can be difficult due to the absence of markets comparable to the organized markets of securities subject to legal regulation. In addition, there may be a lack of transparency regarding the applicable fees when there is the possibility of selling such assets. Their price also tends to suffer strong oscillations without apparent objective cause. The language used in the cryptocurrency environment is usually very technical and unclear, which makes it difficult to know the entity and the nature of the risks assumed with the investment, which may be inappropriate for clients from the point of view of needs and risk profiles. 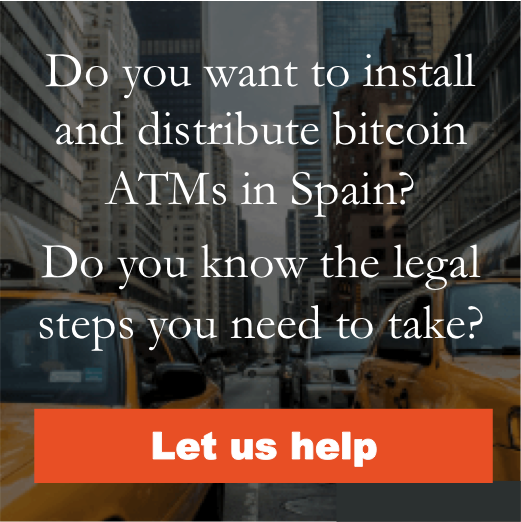 The sale of Bitcoins, to date, is legal in Spain and the rest of the EU. In Spain there is a tendency to demonize cryptocurrencies to such an extent that official bodies recommend their use with caution. In the rest of the world we find positions located in opposite poles (some allow it and others forbid it). In any case, the sale (buying and selling) of Bitcoins, to date, is legal in Spain and the rest of the European Union. Therefore, it is also legal to establish and manage Bitcoins and exchange exchanges in this country. There are issues on which nothing has been said so far or little has been said. The first question is that not all cryptocurrencies are the same: although the underlying technology in most of them is very similar, the logic behind each differs. For example, some cryptocurrencies have the typical features of traditional currencies (since they serve as the unit of account or measure with which the value of goods and services is calculated, and as exchange value, acquisition or means of payment, all of which brings them closer to real national currencies); other cryptocurrencies may “represent” other rights also and their value depends on what “others” do, which brings them closer to financial products, such as transferable securities and derivatives. In my opinion, the type of intervention of the regulatory authorities should be different depending on the type of cryptocurrencies in which we find ourselves: in the first case, the authorities should guarantee that fraudulent behaviors are avoided vis-à-vis consumers, in the second case, should they try to avoid the systemic risk of the general financial system or – perhaps – limit private currencies from interfering in a disturbing way with official monetary policy. The second issue is that the value of cryptocurrencies depends not only on the market but also on security issues. It is important to ensure the vulnerability of the platforms where they are marketed. And since these currencies exist in the virtual world, the sites where they are sold are vulnerable to cybercriminals, although “hacking” the Bitcoin network can be difficult (though not impossible). Investors should be informed about what type of Blockchain technology is being used and who developed the computer code. In addition, it is essential that the interested parties have access to information on what type of cybernetic audits have been carried out before and during the issuance of the virtual currency. The third issue is to be clear that the value of Bitcoin comes from the fact that another person wants to accept it. That is, if you had a Bitcoin and you could not sell it, it would not be worth anything to you. Eric Maskin (Nobel Prize in Economics in 2007) has said that “the fundamental value of a Bitcoin is zero”. The key, in any case, seems to be to achieve an ideal balance: that the supervisory and regulatory authorities protect the financial markets, while leaving room for innovation. If you found this post useful, leave us your comments at the end and share it on your social networks. Thank you. For this reason, they use cryptographic techniques designed to avoid falsifications and avoid identifying the original owners of the coins since these are registered as digital address uncorrelated with real life. CORTÉS Luis Javier, Contratos y Mercados Financieros, in Lecciones de Derecho Mercantil, Volume II. Madrid: Aranzadi, 2015, p. 196. Although this Directive is currently in force, the Member States of the European Union have until January 10, 2020, to transpose it, that is, to adopt the legal, regulatory and administrative provisions necessary to comply with the provisions established by it. Electronic money is any monetary value stored by electronic or magnetic means that represents a credit on the issuer, which is issued upon receipt of funds for the purpose of making payment transactions (that is, an action initiated by the payer or by the beneficiary, to locate, transfer or withdraw funds, regardless of any underlying obligations between both), and that is accepted by a natural or legal person other than the electronic money issuer. This incorporation is made in article 1 that adds the letters g) and h) to article 2.1.3) of the Fourth Directive. "Fiduciary currency" or “Fiat currency” are the coins and bills designated as the legal means of a country. The Motions can be presented by a Commission, by a Parliamentary Group or by a minimum of ten Senators (article 175 of the Senate Regulation), and, as acts of political impulse, may have some of the following purposes (article 174 of the Senate Regulation): a) That the Government formulates a statement on a subject, or refer to the Parliament (Cortes Generales) a “proposed law” regulating a matter of the competence of the Parliament. b) That the Chamber of Deputies deliberates and decides on a text of a non-legislative nature, and must be accompanied, where appropriate, by an evaluation of its economic cost (article 175.2 of the Senate Regulation). In this case, it was the first type of Motion mentioned. Interview conducted in the Spanish newspaper “Cinco Días” on Thursday, February 22, 2018, p. 23, paper edition.